Classified monument on the hill side. 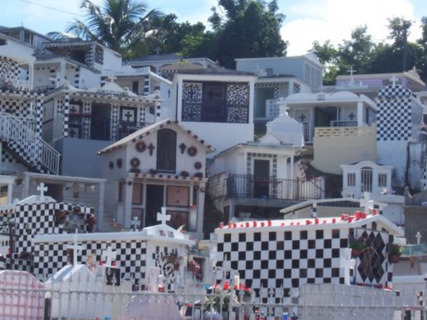 The cemetery is famous for its black-and-white-checkered tiled graves. On All Saints day, thousand of nighlights illuminate the cemetery which looks like a gigantic chessboard. Interesting! I’d love to see it on All Saints Day (the day after Halloween). The black and white represents good and evil. Super ! C'est un lieu unique et magnifique. A visiter absolument !